Over the last few weeks my families lives and mine have been changed drastically. Imagine going for a test for a minor complaint, just an occasional ache in your side, only to discover that you have kidney cancer. I am in shock and still having a difficult time dealing with this diagnosis. I know that this will be the fight of my life and these are just some of the things I am fighting for. 1. I want to walk my daughter Keryn down the aisle and when they ask who gives this women to be married to this man. I want to proudly say “I DO”. 2. I want to dance with my son Ryan at his wedding. 3. I want to watch my son Ryan hold his first born child in his arms, know the miracle of life & see the awe in his eyes. 4. I want to watch my daughter Keryn hold her first born child in her arms, know the miracle of life & see the awe in her eyes. 5. I want to grow old with my honey, Ian. 6. 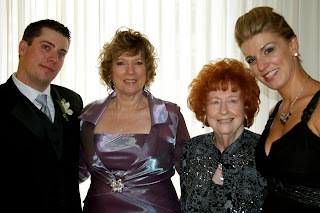 I want to plan my Mum’s 90th birthday party on Aug 29, 2012. 7. I want to be standing side by side with my siblings, Richard, Wayne and Susie if something were to happen to my Mum. 8. I want to sit with Susie & Keryn and laugh and listen to all their silly stories. 9. I want to decorate my Christmas tree and have everyone over on Christmas Eve. 10. I want to go and visit Julie & Leo in Florida and have a lovely holiday with them. I always feel so welcome in their home. 11. I want to work with Jane, Robert & Sherri at MAD until we grow old and retire. 12. I want to enjoy Thanksgiving Dinner at Wayne’s cottage or Richard’s house or the old hunting camp as long as all my family is there. 13. I want to see Jen complete school and become the success I know she can be. 14. I want to plan brunches, lunches, dinners and parties and share wonderfully good times with all my best friends and family. 15. I want to sit on the floor and play with my grandchildren and watch them grow. 16. I want to watch the sunrise and sunset on a tropical beach with my honey. 17. I want to share a bottle of wine with Jane & Robert at their villa in Tuscany. 18. I want to watch all the sweet wee ones , Ben, Lola, Tyler and Jada grow up. 19. I want to see Ryan find a great career that he loves.